"Forgotten lines of ancient magic and the power of the throne. One will make them both his own if his heart sees the true power. . . " So begins the ancient Cremelino Prophecy. In this new Young Adult/Teen fantasy series, Darius San Williams, son of one of King Edward's councilors, cares little for his father's politics and vows to leave the city of Anikari to protect and bring glory to the Realm. But when a new-found and ancient power emerges from within him, he and his friends Christine and Kelln are faced with decisions that could shatter or fulfill the prophecy and the lives of all those they know. Wizards and magic have long been looked down upon in the Realm, but Darius learns that no matter where he goes, prophecy and destiny are waiting to find him. The Path of Destiny is a story of seeking your identity. All stories begin with the author introducing us to the characters and settings and then they move along into the adventure. In The Path of Destiny, the characters are still trying to determine who they are. This results in less adventure and more character development. 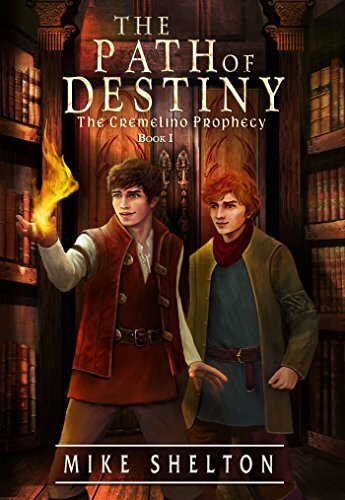 In essence, this first book of The Cremelino Prophecy is one long character development story. This has a tendency to make the story drag a bit. It was harder to engage with then I would like. 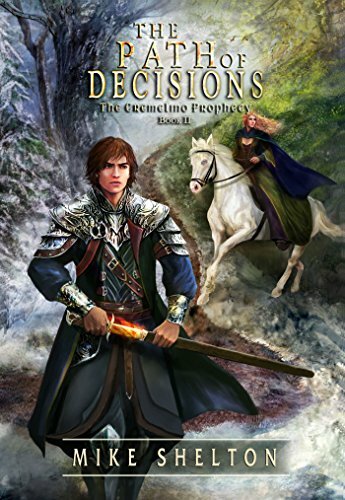 Before posting this review I did go ahead and read the second story in the series, The Path of Decisions. I can tell you that it picks up and you start to enjoy a true fantasy adventure story. It earned four stars from me as opposed to the three stars I have given to The Path of Destiny. So sticking with book one is worth it as you move on to book two. Mike Shelton introduces heavy topics such as the seeking of identity, leadership, family dynamics, good and evil, love and hate in a way that is helpful but not heavy. Interlaced within is the fun of magic; one aspect of which is the Cremelino horses. It’s worth reading just to find out about these horses. I’ll take one, please!! If you can deal with a slow start in order to enjoy a story that grows into a very interesting fantasy, read The Path of Destiny and then pick up The Path of Decisions. I’m on now to read The Path of Peace to round out the trilogy. I received a review copy in exchange for my honest and unbiased review. My thanks to the author, publisher, and Kathy at eBooks for Review. Mike was born in California and has lived in multiple states from the west coast to the east coast. He cannot remember a time when he wasn't reading a book. At school, home, on vacation, at work at lunch time, and yes even a few pages in the car (at times when he just couldn't put that great book down). Though he has read all sorts of genres he has always been drawn to fantasy. It is his way of escaping to a simpler time filled with magic, wonders and heroics of young men and women. Mike began writing stories in elementary school and moved onto larger novels in his early adult years. He has worked in corporate finance for most of his career. That, along with spending time with his wonderful family and obligations at church has made it difficult to find the time to truly dedicate to writing. In the last few years as his children have become older he has returned to doing what he truly enjoys - writing!